there is not a lot ways to do it, i could add it as an config option that people enable it in the config. but, if some mod adds something new, that nobody else created before, i will need to do some kind of "maintenance". so, my idea, is to it be a list, in the config, where the user add on it, things that he want to unify. actually, i'm planning this feature for quite long time. and, unfortunately, there is no way to create an integration to unify gems. i hope everything makes sense, and, sorry about my english, probably there is a lot of english mistakes. I created the UniDict mod because I was having the same problems that you were having, and I'm glad that this was able to help you! 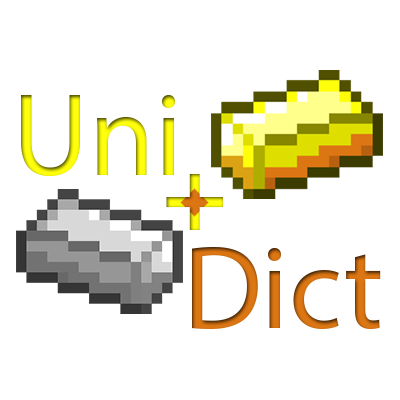 for exemple, they will be smelt into ingot , also could be used to make alloys in things that use ore-dict. so you want to be possible to melt them in the smeltery? Hello! Thank you for a great mod. If possible, please add support for carpenter of Forestry. thanks, the next update will have carpenter integration. in this case the user probably need to set "keepOneEntry" to false. i will try my best to avoid another situations like this. Yeah, feel free to add compatibility with FSP. Thanks for such a great mod :) Is it OK if I use this in a modpack?